I have a favorite cartoon that came to me in the form of a birthday card. I keep it on my refirgerator because it sums up life's choices perfectly for me. In the cartoon, a waiter in a posh restaurant stands before a couple who are seated at his table. He says: We have two menu options today. Which would you prefer...the "My Body is a Temple" menu, or the "Life is Short, Whooppeee!" menu?" I chuckle every time I see it, because even though my usual approach to upholding my diet (or my budget, or my work schedule...) is to follow a well-intentioned, regimented plan, I do occasionally give in to the urge to splurge. And I feel it is important, every now and then, to eat that piece of chocolate cake or buy that pair of fabulous shoes. This is what gives life balance. The silly cartoon reminds me that life is short, and special moments need to be acknowledged and celebrated. Recent days have brought this truism to light for me. The tragic Florida school shootings; the death of a childhood friend's father; and the passing of two of my friends' beloved dog companions, remind me that time is fleeting. Every day, I remember to say a little prayer of gratitude for all of my blessings. I think about my role in life and ask what I can do to help others. Luckily, artists have many ways to help enhance people's lives. Through our work, we can choose to inspire, to dazzle, to uplift and to educate. Artwork can create moods of tranquility, of energy, of compassion and of hope. One of my greatest joys as an artist is to help people celebrate their special moments by creating paingings that remind them, every day, of the people and places that have brought them joy. A painting of your home that you lived in for many years but are about to leave; a view of your garden in all its glory; a portrait of your beloved furbaby who lights up your life with unconditional love... these are creative opportunities for me to help people remember what is most dear to their hearts. So today, I am putting myself out there to ask you...what brings you joy? What are the moments that are special to you that you would like to hang on to forever? Maybe now is the time to finally get that portrait you've been dreaming about. It would be my greatest pleasure to create something for you that is meaningful. Over the years, I have created artwork in many mediums and creative styles, and can work with you to create a special piece that fits your space and budget. For inspiration, I thought I'd share with you some samples of commissioned artwork that you may not have seen. These special pieces are more than simple portraits...they are infused with my clients' unique dreams and wishes, created to preserve special moments that are personal to them. This house portrait shows the client's home in the springtime, their favorite season. I worked with several reference photos to create a piece that resonated with them. This is a sample of my work using colored pencils, which have a softer feel than acrylic paints. Colored pencil on paper, Nina Davidowitz copyright 2012. Friends who were moving out of their long-time residence commissioned this painting showing the lush gardens along the front of their house. They decided to name the painting "Summer Splendor". It reminds them of happy times with family and friends in a place very dear to them. This painting is fun because it is a house portrait, but I snuck in a beloved character in the front yard... the owner's Black Lab! This is a view of their home in the summertime. 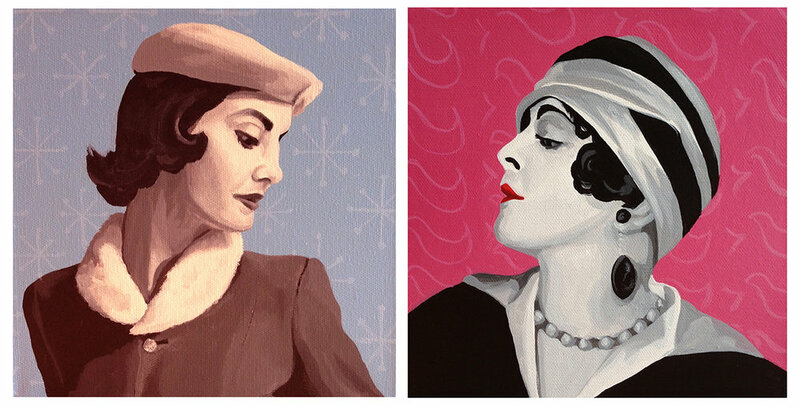 These two paintings were done in acrylic paints on canvas, but are based on old black & white photos. I love the look of doing the figures in monochrome but adding color and some fun designs in the background for a touch of whimsy! Is it time for you to "Celebrate the Now" with a commemorative piece of artwork? Consultations are always free. Let's create something to cherish forever!